JCPA: Has the Body of Israeli Hero Eli Cohen Been Recovered? The Syrian opposition issued reports that the remains of the Israeli spy Eli Cohen had been delivered to the Russians, and they also gave details about the remains of Israelis buried in Syria, in general. There has been no clear Israeli denial of these reports. If Cohen’s remains have indeed been transferred, they will have to undergo Israeli identification. Meanwhile, the Syrian opposition also issued new information on how Syrian intelligence has been guarding the remains of Israelis in Syria at President Bashar Assad’s bidding. The Syrian opposition reported on the remains of Israelis and how the Syrian regime has been tending to them. The first report was issued on Twitter on April 14, 2019, by someone in the Syrian opposition, and it concerned the remains of the Israeli spy Eli Cohen. There are unverified leaks within Damascus itself about a coffin that was transferred with the Russian delegation that left Syria. The leaks say the coffin may contain the remains of the Israeli spy Eli Cohen. We are awaiting verification. Rumors circulated Sunday night that a Russian team, possibly assisted by Syrian opposition groups, had extricated the remains of venerated Israeli spy Eli Cohen, taking them from Syria in a coffin and preparing to return him to Israel. The legendary “our man in Damascus,” Cohen spied on the Syrian military establishment for four years after befriending top-level Syrian officials and celebrities under the alias Kamel Amin Thaabet. After being discovered, he was tortured by the Syrians before being executed on May 18, 1965. In Israel, his name became synonymous with self-sacrifice and heroism, the information he provided having been fundamental to Israel’s decisive victory in the Six Day War. Israeli officials have kept silent regarding the reports, which came in just two weeks after Sgt. 1st Class Zachary Baumel was buried on Mount Herzl, 37 years after he went missing during a battle of in Operation Peace for the Galilee. Baumel was also exhumed by Russia and his personal effects were honored in a special ceremony in Moscow attended by Israeli Prime Minister Benjamin Netanyahu. Since Cohen’s execution, widow Nadia Cohen has been working to bring his remains home but to no avail. In 2008, a former bureau chief of former Syrian leader Hafez Assad said no one knew where Cohen was buried, because the grave had been relocated when officials became concerned that Israel would find it. Last year, Nadia was presented with her late husband’s wristwatch by the Mossad intelligence agency, an article which had been retrieved in a special operation. With victimhood being the most prominent component of Palestinian identity, and with the world increasingly condemning Antisemitism, the Palestinian Authority has decided to embrace Antisemitism as a new category of Palestinian victimhood. The PA Foreign Ministry has announced that since Palestinians are “Semites,” any policies that harm Palestinians are expressions of Antisemitism. 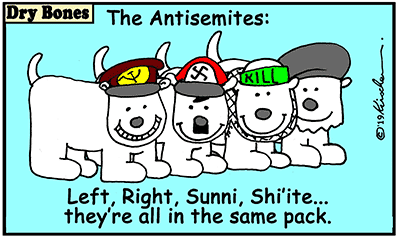 Since the PA sees Zionism as victimizing Palestinians – “Zionism is hostile to Palestine” – they conclude that Zionism inherently is Antisemitism. Moreover, American policy critical of the Palestinian Authority, is likewise Antisemitism. According to the PA’s new announcement, anti-Zionism cannot be Antisemitism because Zionism itself, by hurting Palestinians, is Antisemitism. The Trump administration’s peace plan, known as the “deal of the century” will reportedly include “practical proposals” for improving the lives of Palestinians, but it will probably stop short of recommending the establishment of a sovereign Palestinian state alongside Israel, The Washington Post reported Monday night. According to the Post report, comments from Kushner and other US officials suggest that “the plan does away with statehood as the starting premise of peace efforts” as it has been over the last 20 years or so. Although Palestinian Authority President Mahmoud Abbas has said that the US is biased, one of his chief advisers reportedly said they would not reject Trump’s plan outright. Merkel’s office said she insisted, in a phone conversation Monday, on the continued relevance of a two-state solution, saying that should be the goal of international efforts. During the final stretch of his election campaign, Netanyahu pledged for the first time to annex parts of Judea and Samaria in a bid to rally his right-wing base. Netanyahu has reneged on election eve promises before but should he follow through on this one, it would mark a dramatic development and potentially wipe out the already diminishing hope for Palestinian statehood. Faisal’s aim was to forge Iraq—its Arabs and Kurds, its Sunnis and Shiites—into a nation. By 1932, he still had plenty to do. . . . Did Faisal’s premature demise change the course of history? Some might say not. After all, the Iraqi monarchy survived for another 25 years, until the 1958 revolution. [His son and successor] Ghazi lacked his father’s moderation, but he died in a car crash in 1939. The next in line was a child, so Iraq was then ruled by a regent, in partnership with Faisal’s own faithful lieutenants. . . . But one thing is certain: Faisal departed the scene in the middle of his own arc. He had done much, but more remained to be done, and he was still in a position to do it. Let me now give a contrary example, of an unexpected death that came too late to have a huge effect. Gamal Abdul Nasser and his Free Officers overthrew the Egyptian monarchy in 1952. He soon emerged as the first among equals, then as the unquestioned ruler of Egypt. His biography became identical to Egypt’s history: the Soviet alliance, the Suez war, the Nasserist wave of 1958, the makeup and breakup of union with Syria, the stumble of the Yemen war, and the disaster of the 1967 war with Israel. . . . In [a sense], he was finished before he was dead; he was already at the end of his arc. . . . THE ORIGINS OF THE PALESTINIAN CAUSE from Pierre Rehov on Vimeo. U.S. declines to renominate Gay McDougall—a key defender of the UN’s antisemitic Durban Racism Conference—to post on UN racism committee. An agreement has been reached between the Israeli Prison Service and the leadership of Hamas prisoners, which will end the inmates’ hunger strike in return for meeting the security prisoners’ demands, Palestinian reports said Monday. The “Palestinian Prisoners’ Information Ministry” said that as part of the agreement, prisoners would receive public phones in their cells to circumvent the phone-jamming devices, which prevents them from using private cell phones in their cells. This will allow security officials to supervise the prisoners’ phone calls with the outside world. The prisoners held in Israeli prisons several times postponed planned hunger strikes over the last week, which they announced in protest to the jamming devices in a number of prisons. In 2017, for example, the head of the Shin Bet security service, Nadav Argaman, warned that terror groups may try to carry out attacks during Passover. The 2014 kidnapping and murder of the three teenagers led to Israel embarking on Operation Brothers’ Keepers (Tzouk Eitan), culminating in the arrest of 350 Palestinians. The IDF then launched Operation Protective Edge against Hamas in the Gaza Strip. After a massive manhunt, the bodies of the three victims were found near Hebron at the end of June. Hamas was seen as the responsible party, despite official group leaders claiming they were unaware of the kidnapping. The Palestinian Authority’s sanctions against the Gaza Strip are beginning to take their toll. The sanctions include, among other things, cutting payments to hundreds of families of Palestinian “martyrs” who were killed by the IDF. As part of the sanctions, which are seen in the context of the PA’s ongoing dispute with Hamas, payments to thousands of civil servants and needy families have also been halted. On Sunday, the father of a Palestinian man who was killed by the IDF in 2012 offered his house for sale. The son, Tareq, was 22 years old when he was reportedly killed by IDF gunfire near the border between the Gaza Strip and Israel. Two other Palestinians were killed in the incident: Akram Sami al_Za’aneen and Ehab Sami al-Za’aneen. After he was wounded, al-Kafarneh managed to phone a local hospital to ask for help. He died before medics arrived at the scene, Palestinian sources said. The father told the Palestinian news agency Safa that he was no longer able to pay the bank the monthly installment of $340 for the loan he took to purchase the house. He said the monthly stipend he once receive from the PA was suspended three months ago. Palestinian political researcher Sheikh Ahmad Al-Khatwani said in an address he delivered at the Al Aqsa Mosque that Istanbul had been conquered just like the Prophet Muhammad had predicted, and that Rome will also be conquered according to Muhammad’s predictions. Al-Khatwani said that Muslims do not hate non-Muslims; rather, he said that all Muslims do “break down the physical obstacles” that prevent the “hateful infidels” from being brought into the light of Islam. He said that Islam is a religion for all of mankind and that the “physical obstacles” will be broken down by “a huge Muslim army that will wage Jihad for the sake of Allah.” The video of the address was uploaded to the Internet on March 31, 2019. A group of activists aims to assist Palestinian missiles and other projectiles that have escaped the Gaza Strip by traveling in a ballistic arc into the Jewish State, and that face hostility, misunderstanding, and numerous violent efforts to destroy them. New organization Students United In Compassion for Illegal Destitute Explosives (SUICIDE), based at Tel Aviv University, launched a program this week to identify, locate, contact, and protect the rockets and other explosive projectiles that Hamas and allied terrorist groups fire into Israel. The group urges Israelis to contact them instead of the police or IDF upon discovering such projectiles, or parts of them, via its SUICIDE Hotline. A representative of the organization told journalists that these refugees from miserable Gaza deserve a welcome embrace, not further violence at the hands of sappers. US-backed forces proclaimed the capture of Islamic State’s last territory in Syria last month, eliminating its rule over a caliphate it had proclaimed in Iraq and Syria in 2014. They were among up to 180,000 people who may have been killed during Saddam’s “Anfal” campaign that targeted Iraqi Kurds in the late 1980s when chemical gas was used, villages were razed, and thousands of Kurds were forced into camps. Despite Iran’s destructive behavior, such as support for terror and militia groups across the region, the European Union has chosen to help the ruling mullahs of Iran, ostensibly to maintain the flimsy, illegal, never-signed, unratified “nuclear deal” — but possibly even more as an embarrassingly transparent attempt, if the EU could be embarrassed, to navigate around US economic and political pressure and continue doing business with the regime. Iranian FM Zarif says the Iran nuclear deal contains no prohibitions on Iran enriching uranium. Was that also US understanding of deal? The Iran nuclear deal was designed and implemented to legalize Iran’s nuclear program not roll it back. On March 29, 2019, Al-Nujaba TV (Iraq) aired a report about foreign support for NGOs operating in Iraq. Hamid Al-Husseini, the Secretary-General of the Union of Iraqi Radio and TV Networks, said that the roughly 3,000 “dubious” NGOs operating in Baghdad were established by the U.S. occupation and target Iraqi youth. He said that most of these NGOs are run by larger organizations that were founded by Jews. Iraqi political analyst Mahmoud Al-Hashemi said that the NGOs are part of a “soft war” being waged by the U.S. and Israel to fragment Iraqi society and plant Western values in it. Hashem Al-Kindi of the Al-Hadaf Research Center said that some of the NGOs organize festivals in Iraq. He gave the example of a kite festival organized to show support for the Iraqi security forces and he claimed that its main purpose was actually to have dancing, singing, and free mixing of the sexes. He said that the kites that were flown were in the colors of the LGBT flag. Al-Kindi also said that the NGOs encourage women to dress in ways that contradict shari’a law and influence men to style their beards to look like Theodor Hertzl. Afghanistan’s last Jew, Zevulun Simantov, has long been a curiosity for the western media. In previous reports, Simantov has almost laughed off the Taliban’s efforts to convert him. But this time, things seem to be getting serious. Someone has pulled Jewish ‘placecards’ off the walls and torn them up. Afghans are still trying to convert Simantov to Islam. But he won’t do it, even if they paid him.